Nadeshiko takes out silver medal! 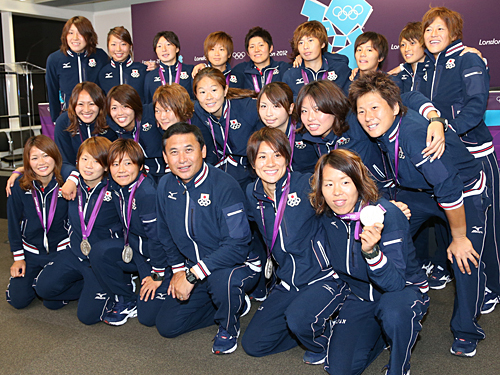 Nadeshiko Japan, women's national football team, have won silver medal at the London Olympics. I woke up 3:30 am to watch this game, and was obviously cheering for Nadeshiko to win the tournament. It was a re-match from the World Cup final where Japan beat USA in a penalty shoot-out to take out the World Cup for the first time ever in 2011. That World Cup win gave a lot of hope to the people in Japan as it was soon after our Earthquake and Tsunami tragedy. This time around in the Olympics, USA took gold medal and Japan ended up with silver. Nadeshiko showed so much grit throughout the tournament, and this game was no different. After being down 0-1, Nadeshiko seem to take control and had better opportunities but could not convert. Both teams had chances in the 2nd half, but a great strike from Lloyd gave USA a comfortable 2-0 lead. Ogimi, who was outstanding for Nadeshiko in the Olympics pulled 1 goal back and Iwabuchi, who had come on in the latter stage of the game had the golden opportunity to equalise with few minutes left, but only for Solo to keep the shot out. Definitely, definitely was a game worth waking up for and although we lost the match, I was so moved by these Nadeshiko girls just like in the World Cup. We have a lot to learn from this team!